I’m desperately searching for inspiration about how to tell you about these muffins and I’m having the toughest time. They’re so simple, yet so incredible. They’re so (seemingly) nondescript, but so moist, flavorful, and bursting with fresh, vibrant fruit and veggie flavors. They’re the perfect back to school snack. And they’re the perfect snack to celebrate my last year of not having to worry about back to school (or having to worry about worrying about back to school). They’re so easy that it would be a crime not to make them asap. Grab and bowl and a spoon and let’s get started. The easiest part about these is that the base is….a mix. WAIT. Hear me out. You know I don’t mess around when it comes to ingredients, so I used a Simple Mills banana bread and muffin mix (which the above picture probably gave away) as the base for these muffins because we have been juggling a lot this summer in my house, but that doesn’t alleviate the need for muffins in the slightest. Talk to me about maximizing the efficiency with which I can get a muffin from the bowl to the oven to my mouth, and I’ll talk to you about Simple Mills. If you’re not familiar with this brand, you must be new here (welcome!) because I have worked with them for a long time and never stop loving their products. 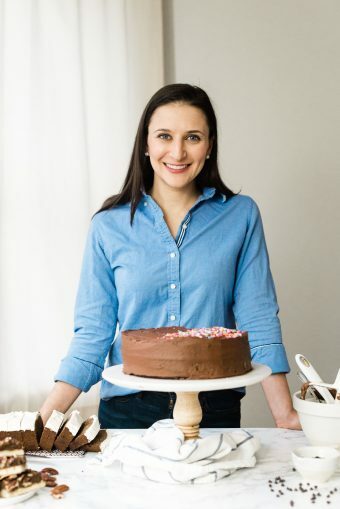 Forget the taste (which is, incidentally, outstanding), and instead consider the guts of the brand: simple, natural, real food ingredients that you know, love and can pronounce. I’m not big on endorsing a lot of products on this site, but you can tell from the number of times I’ve used Simple Mills products in a recipe that I can’t live without this brand. I have a feeling that I’ll be relying on it even more frequently as soon as Baby Bake arrives and puts my current state of busy-ness, sleep deprivation and multitasking to shame. Speaking of which, whether or not you are sending anyone back to school in the next couple of weeks (or did already? Have some schools already started? 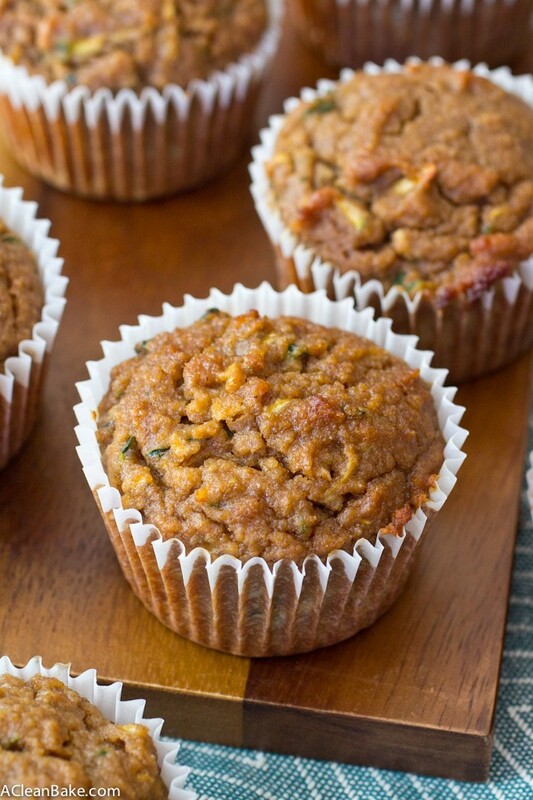 ), these muffins give you no excuse to skip a healthy snack. They’re high in protein and healthy fat, lower carb and packed with nutritious, fiber-rich fruits and veggies so they are the perfect antidote to the 3pm slump. Or, if you’re me, the 9:45am slump, at which point I either need to eat something or go back to bed for the rest of the day. I’m not exaggerating when I say that healthy, low-glycemic snacks like these muffins are saving my life, or at least my productivity and focus, every day and without them I wouldn’t be able to make it through even half of the day. Who else could use a little pick me up? If you’re raising your hand right now, let me make it even easier for you! I’m giving away a box of the Simple Mills banana muffin mix so that you can make these muffins asap, and I’m even throwing in a box of Simple Mill’s new Fine Ground Sea Salt Crackers (<– actual crackers that you can eat out of the box, no baking required. Don’t you miss that?!) All you have to do to enter is leave me a comment below telling me about one awesome, unusual or otherwise memorable thing you did this summer. I’ll randomly pick a winner on Friday (8/26) so let me know soon! The contest is now closed! Thank you to all who left me messages below. Your summer plans sound amazing!! Preheat the oven to 350F. Line 9 compartments of a 12-cup standard muffin tin with papers, or coat thoroughly with oil or nonstick spray. Set aside. In a large mixing bowl, whisk together the eggs and oil, then add the zucchini and apple and mix to combine. Stir in the pumpkin pie spice, then the Simple Mills mix. Stir until combined, but do not overmix. Use an ice cream scoop or large spoon to divide the batter between the 9 prepared muffin compartments. Bake for 30-35 minutes, until the muffins are domed, golden brown, and firm and springy to the touch. If you don’t have pumpkin pie spice on hand, you can replace it with cinnamon. Store leftovers in an airtight container in the fridge for up to a week. These will also freeze well, tightly wrapped, for up to 3 months. I LOVE simple mills mixes! These muffins look super yummy! its like three amazing quick breads combined! You’re totally right, Bethany! I didn’t think of that! 2 weeks!? That IS awesome! Staycations are the best sometimes – the benefit of a vacation but you get to sleep in your own bed!! Did you visit any vineyards in particular you’d ‘recommend? Woohoo!! I”m so happy that you got to go on a couple of big vacations! With all that you juggle, you deserve to totally escape and have fun! I bet my sons would love these muffins! My favorite thing this summer was going hiking with my family to a place that has a waterfall, a lake with a beach and a creek to explore! Ohh that hiking location sounds absolutely beautiful! I’ve never used Simple Mills mixes before and am kicking myself that I’ve never picked one up off the shelf! I’m always skeptical of boxed mixes, but I LOVE the go-for-you and pronounceable ingredients 🙂 It’s hard to pick just ONE memorable thing that I did this summer, but I spent a long weekend in Lake Geneva with Pat’s family and we rented a jet ski one morning and it was amazing! I miss being out on the water and it was just so incredible. I hear you completely: I was SO skeptical of anything in a box until I tried Simple Mills. It’s not a mix like other mixes out there. It is basically just pre-mixed ingredients in a format that saves me the trouble of getting a thousand ingredients out of my pantry and measuring and mixing them all together. My gosh it saves time! I’m so jealous that you got to go to Lake Geneva! I have only been there once if you can believe it (given how close it is to Chicago) but it was an amazing weekend with close friends. I didn’t get to jet ski though. Sounds like fun!! I love Simple Mills! They are one of the few brands I can truly get behind. My husband and I tend to travel more during the off season (May and September) but this summer has been filled with local concerts, outdoor yoga, visiting new breweries, and a house project or two. This is our second summer in our city and I am finding so much to explore. I went to a community pop up dinner! It was so much fun. The dinner was hosted by a chef, set up in a garden with people from all over the city coming together to mingle. There will never be another one exactly like it! Oh neat!! I’ve heard about those pop up dinner events, but never been to one myself. It sounds like it was an incredible evening! Oh I’m sorry! Don’t worry, I didn’t delete it , but I did take it offline temporarily. My plan is to tweak some older recipes, including the doughnuts, and rephotograph them, but I am finding the time to do so is harder to come by than I imagined. If you need the recipes, email me (acleanbake@gmail.com) and I’ll send it to you! I love Simple Mills and can’t wait to try this recipe! This summer I took an aerial hoop class where I flipped, mounted and posed on an aerial hoop. Definitely a must try! Whoa!! That sounds like a totally amazing class! Were you scared? One memorable thing I did this summer was change jobs…and I took two weeks off between and spent that time with my family at the cabin, completely disconnected from real life. It was so refreshing. Congrats on the new job!! And boy do those two disconnected weeks sound like a treat! 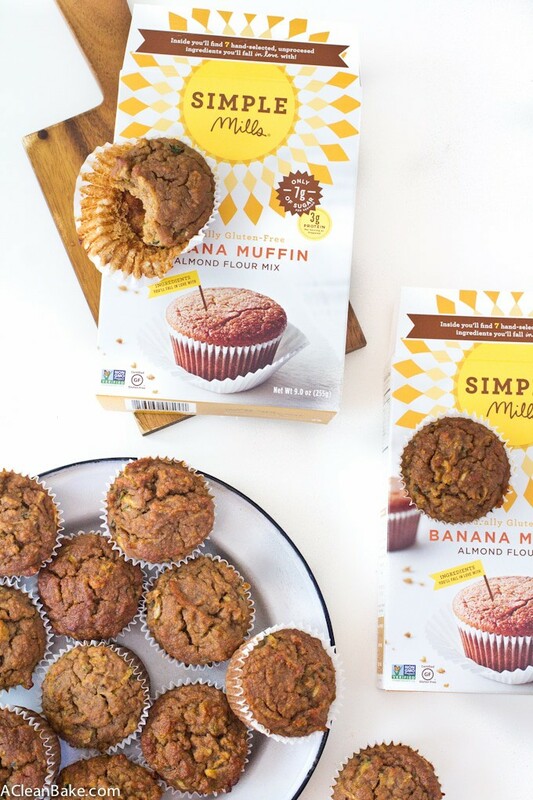 I am dying to try the Simple Mills bake mixes! Those muffins look divine! Memorable summer moment— moving back to DC from Miami! Thanks for another great giveaway! Wow, congrats on the move! I hope you’re all settled in and enjoying life back in DC! I’m loving the combination of flavors here! 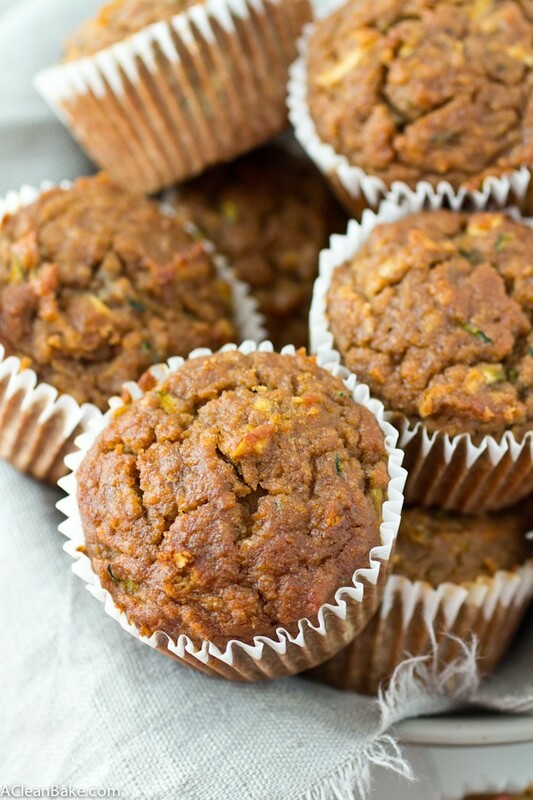 Zucchini and banana muffins/bread are my all-time fave, so I love the idea of combining the two. And the apple…I’ll take it all!! Insert clapping hands emoji here! This summer my family and I all took a trip to Garlinburg TN. We went to Dixie Stampede, Dollywood, and so much more. We had a great time and made some awesome memories. Oh how fun! I’v’e heard of Dixie Stampede and Dollywood but never gone myself. Sounds like a wonderful family trip! Wow I need to try this recipe! This summer, my husband and I went to Canyon Ranch at Lenox. It was the most relaxing and purifying trip. The food was amazing, and it felt so relieving to know it was all healthy. I came back understanding that everyone should be eating anything in moderation with portion control. I loved how they served everything in these cute mini white bowls. I used to restrict myself from eating many foods as naming them as unhealthy. Instead, I went to Home Goods to get those bowls to help with portion control and now I’m on a healthy baking streak and eating everything in moderation. Another good strategy for me is to use smaller bowls for eating mains and not going for seconds. Thanks for listening! Congratulations on your wedding! Where did you go for your honeymoon? Hi! I just learned about Simple Mills products and found the crackers at a Sprouts nearby – so good!!! I would love to try the muffin mixes too. This summer, my husband and I traveled to North Carolina for a conference in Asheville, and then took a road trip to Mt. Pisgah, the Blue Ridge Parkway and all the way to the Outer Banks! Oh Asheville is such a great city!! And the surrounding area is so beautiful. I hope you had a wonderful time!! We took a trip to Seattle. First time there. Fun! What a wonderful city! Did you get to see the fish being thrown at Pike’s Place Market? This summer, I went on a trip to mountain view, California where I ate endless celiac safe food! Amazing! Hooray for eating freely and safely! One of the many reasons why Mountain View is such a great town 🙂 I hope you had a blast! This summer, we took a family trip to Sanibel Island in Southern Florida. My parents went there for their honeymoon 23 years ago, so it was nice for us to experience the beauty of Sanibel together as a family! Everything from the breathtaking sunsets to the beautiful, warm beaches made the trip absolutely perfect and super relaxing! It’s so important to take a break sometimes from the hustle and bustle of everyday life to enjoy a little family time! We love Simple Mills and their all-natural options! 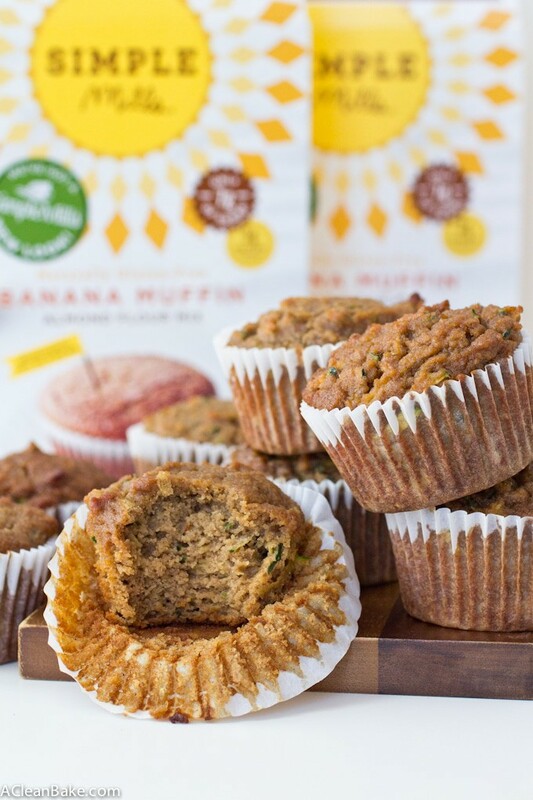 Those muffins look amazing and I can’t wait to try them out for breakfast sometime soon! Love your page and blog – so inspiring! Keep up the amazing work! Looking forward to seeing all the great posts and recipes to come! To win the give away so I can try out simple mills! It will be a first!! 🙂 thanks for being awesome! Thanks, Shelby! I’m so glad you are enjoying the recipes! Wow, I’ve never heard of Ivory Ella but since you speak so highly of them, I’ll have to check them out! I went paddle boarding for the first time with my family this summer! I was so nervous at first but by the end we were having a blast! We even started jumping off the boards and doing flips, it was great! My kids were really impressed, calling me mommy 2.0! It was a good day, and a great memory! Whoa!! Look at you, you’re practically an Olympian! I’ve heard paddle boarding is very hard (and a great work out) but it sounds like you nailed it! Got on a plane with only two hours notice and took the kids in a hiking trip to the San Juan Islands. Best trip ever! I love your spontaneity! Hope you had an amazing trip!! We spent 5 weeks with our family in TN letting our 3 boys make memories by doing the “summer” things we did growing up …. catching fireflies, running through the sprinkler, riding on the lawn mower with grandpa, enjoy picnics with friend, with friends, shooting fireworks off in the backyard, etc. Oh wow!! What a wonderful family trip. Those are the activities that summer is made of. Your kids are so lucky! I wonder if carrots could be substituted for zucchini in this recipe. Sometimes zucchini can leave a bitter aftertaste. Hi Phyllis! It’s possible, though please be aware that your batter might be a little too dry with carrots (which contain less moisture than a comparable amount of zucchini) so you might need to add a little bit of water or milk to the batter to thin it out. My guess (I haven’t tried this, so truly just a guess!) would be no more than a couple of Tablespoons of extra liquid will be needed. If you try it with carrots, I’d love to know how it turns out! I just ordered the mix. These sound so good. Would avocado oil be a good substitute? Love simple mills. The box says 3 tablespoons of oil. Is there any reason you are using only 2. Less oil is good for me but just wondering. I don’t bake much. Hi Zeel! That’s a great question, and yes! 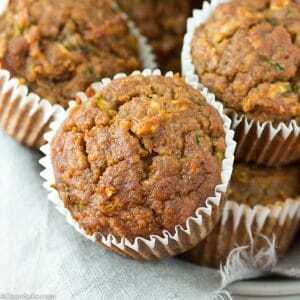 The reason is that oil is one of the sources of moisture in the muffins, but the zucchini, apple and banana also contributes a lot of moisture. That’s why the oil and water is reduced from what it calls for on the box. Also, banana is an excellent source of richness, so it stands in for some of the oil as well. Simply put, the added fruit and veggies reduce the need for some of the oil and water! These look perfect! Will definitely be making them. Wonderful! I hope you love them!